As promised, after yesterday's look at what BBC Worldwide have coming our way in December, here are the other titles which as mentioned before are of a musical nature and arrive on the 9th. 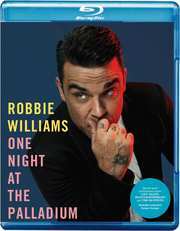 The first of these comes on both DVD and Blu-ray, Robbie Williams: One Night At The Palladium. This carries a recommended retail price of £20.42 for the standard definition and £24.42 for the HD release. Extras will include four songs not found anywhere else and exclusive behind the scenes footage. On Night At The Palladium is Robbie Williams’ first live performance of songs from his forthcoming new album 'Swings Both Ways'. Filmed live at the historic London Palladium the concert features Robbie Williams and some very special guests (including Rufus Wainwright, Lily Allen and Miss The Muppets’ Miss Piggy) singing songs from the new album, which includes both established classics and new songs, penned by Robbie with his long-term musical collaborator Guy Chambers, alongside favourites from the 'Swing When You're Winning' album. From one hearththrob to a bunch of them, joining the above is JLS Goodbye: The Greatest Hits Tour, on DVD only and carrying an RRP of £20.42. Extras will include a goodbye message to fans and behind the scenes footage of tour rehearsals. Earlier this year former X Factor boy band JLS broke a million hearts when they announced that they were splitting up after five amazing years together. But before they call it a day they are embarking on their third and final arena tour in December 2013. 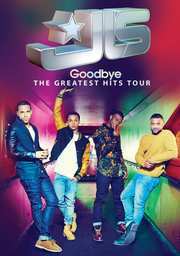 JLS Goodbye: The Greatest Hits Tour will be the last time that Oritsé, Marvin, Aston and JB will perform together as a four. Their performance at The O2 Dublin, Ireland will be filmed live for JLS Goodbye: The Greatest Hits Tour DVD and will chronicle the band’s emotional farewell to their loyal fans.